This article by Jerry Cates, first published on 1 May 2010, was last revised on 5 September 2014. © Bugsinthenews Vol. 11:05(01). 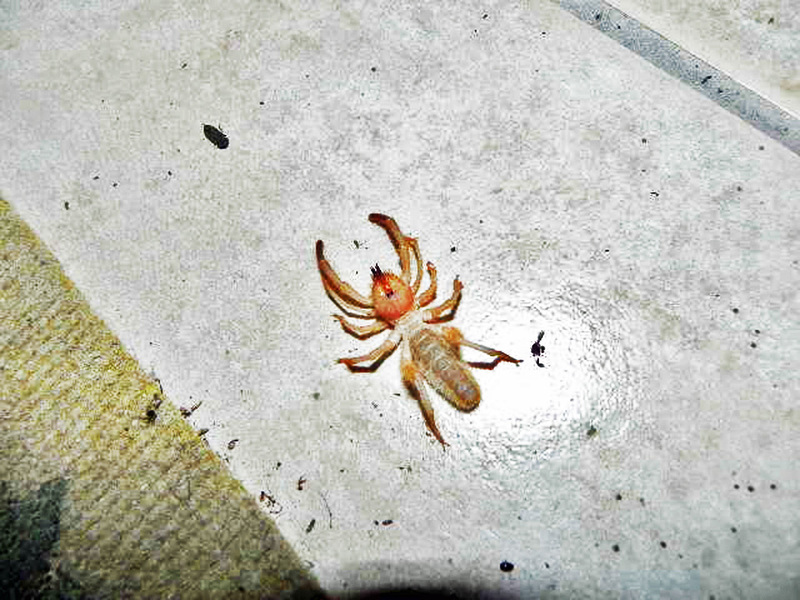 I wrote back that this is an arachnid, in the order Solifugae, and that it is similar to the specimen photographed by Sergio, in Reynosa, Tamaulipas, Mexico, on April 6. Except for the brief note on the observable difference between these two specimens, below, this post will not attempt to repeat the textual information provided in post linked to above. To read that text, click on the link. This specimen is about 1 to 1.5 inches long. It differs from the specimen photographed by Sergio in that the femur of leg IV has what appears as a large tuft of pubescence that is not present in Sergio’s specimen. — Questions? Corrections? Comments? E-mail jerry.cates@entomobiotics.com. You may also leave a comment in the space provided below. No tengo informacion aun sobre este especimen de insecto, gracias por subir esta imagen, en mi casa hemos eliminado varias tipos de arañas iguales, vivo en Jerecuaro, estado mexicano de Guanajuato 1930 metros sobre el nivel del mar (MSNM)con clima sub humedo 19 grados celsius promedio al año.